This weekend we went over to Stacey’s to celebrate St. Patrick’s Day and we had so much fun. The weather has been warm here in Arizona so we were outside all night and when the sun went down we snuggled in around the fire pit. The kids all played until they crashed out on the sofa and the adults ate all night long. I was so excited to get to know Juile (a friend of Stacey’s) more. Isn’t it fun when friends meet friends and it works out. We had so much fun we all ended up back there the next day for a barbeque to finish off the food we didn’t eat the night before! Because we were there to celebrate St. Patrick’s Day I wanted to bring over something green and festive and I knew that Stacey was making the Mint Balls (they were totally amazing) so I wanted to make an appetizer. I wasn’t sure what I wanted to do but knew I wanted to try something new, so of course I found myself on Pinterest! I found this recipe for Edamame Hummus over at Yum Sugar and thought it looked perfect. I love hummus and edamame and wanted to have a nice light option to snack on because I knew I’d be eating all night. 🙂 This recipe makes a gigantic portion but it lasts in the fridge for a few days so you can use it on sandwiches for a yummy spread or as a snack during the week. 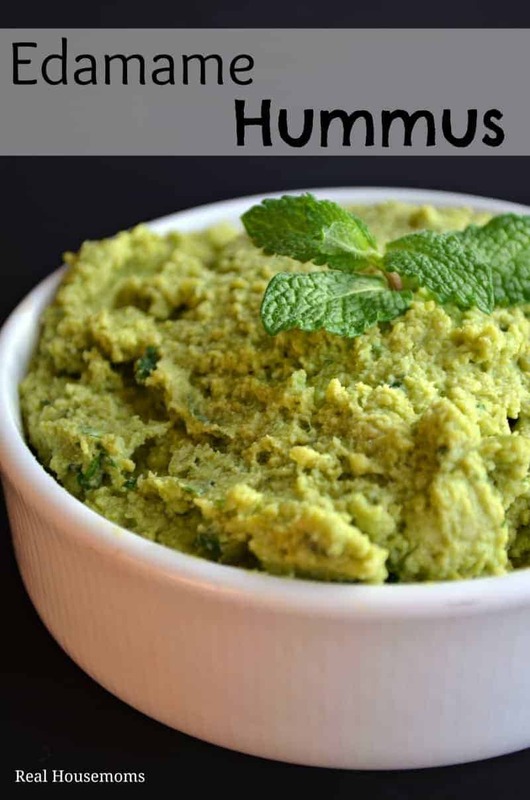 This fun twist on traditional hummus is protein packed with edamame (soybeans) and super delicious with peas, cilantro and mint. This is a party pleaser. Wow! This looks delicious 🙂 Thanks for the recipe; I almost have all of these ingredients in the apartment, too! This seems so simple! I’m going to have to make it for sure!! It really was simple. Let us know what you think when you try it. Nice twist on hummus. I’m always looking for recipes to suit my recently turned vegan husband! Thanks for sharing.. This recipe sounds wonderful, but my daughter is allergic to peas. What could I use as an alternative?